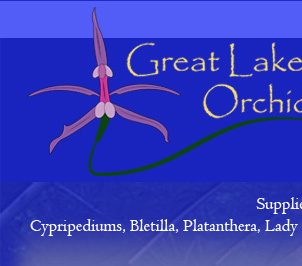 Welcome to Great Lakes Orchids LLC. We operate a family owned tissue culture laboratory and licensed nursery specializing in hardy terrestrial orchids. The orchids are laboratory grown via asymbiotic tissue culture lab techniques. We offer the Platanthera series in orange fringe (P. ciliaris), the white fringed (P. blephariglottis) and the purple fringe (P. pyscodes) as adults and seedlings. The Lady Slipper Orchids (Cypripediums) are available in native and non-native selections. In addition, Bletilla Orchids (Hardy Chinese orchids) and European fringed orchids (Dactylorhiza) are available. We have been expanding our species list and now offer some select hardy perennials, bog plants, and many new arrivals coming soon. As we continue to develop our nursery and expand our laboratory, we are looking forward to supplying you with our plantings. We are proud of our earned reputation for uncompromising quality and customer service. Thanks for visiting our site today. Attention: Our store is now open. Click link above.